Martha's first experience of being in a swimming pool was at a Hotel when she was about 18 months old. We'd been given a wetsuit by the amazing Heartline charity because of how much harder her heart would have to work to hold her temperature in the pool. It worked brilliantly and she seemed to enjoy splashing around with us. A few months later we went to Center Parcs where Martha went swimming again, and it worked a treat. But I couldn't keep her in a neoprene wetsuit forever, especially when her sister was wearing pretty swimming costumes. I decided to brave it and bought Martha a swimming costume and a bikini for our holidays last year. Both on Holiday in Bluestone and in Majorca she tolerated the water temperature really well. I must add that the pool temperature was a fair bit warmer in Bluestone than the pool in Center Parcs. When we were in Majorca, the water was quite cool but the temperature day-to-day ranged from 27-30 degrees. We had a couple of days where the weather wasn't great; as soon as the sun went behind the clouds Martha's lips and nail beds became blue. As much as she loved splashing and jumping in and out of the shallow end of the pool, she was reluctant to go to the deep side even when Mark or I was with her. We wanted her to have more confidence in the water so that when we go on holiday next year, she can run off with the older two and join in the fun. I knew it was high time that I enrolled the girls in swimming lessons, so I signed them up with a local company at the gym Mark goes to. Osh had been for swimming lessons at a local leisure centre, but the classes were quite big and Osh was easily distracted and couldn't follow along. With Martha's heart condition I needed her to be in a smaller class, with instructors who would be in the water with them and the water would be a few degrees warmer. Martha has been having weekly lessons since November. She didn't quite enjoy her first one and the instructor said she had been whining. By the end of the second lesson, the instructor said she'd been much better that day, had jumped in the water on her own and had even let go of the swim noodle. By now she is still wearing armbands but is much happier going into the pool than she was at the beginning. There is a slightly dark red/purple tinge to her lips when she comes out of the water but it disappears once she's had a warm shower and is fully clothed. I find the changing rooms in the gym much warmer than the leisure centre I went to when I was little. That's making such a difference in my opinion, there's nothing worse than getting dressed in a cold room when you've just been swimming. 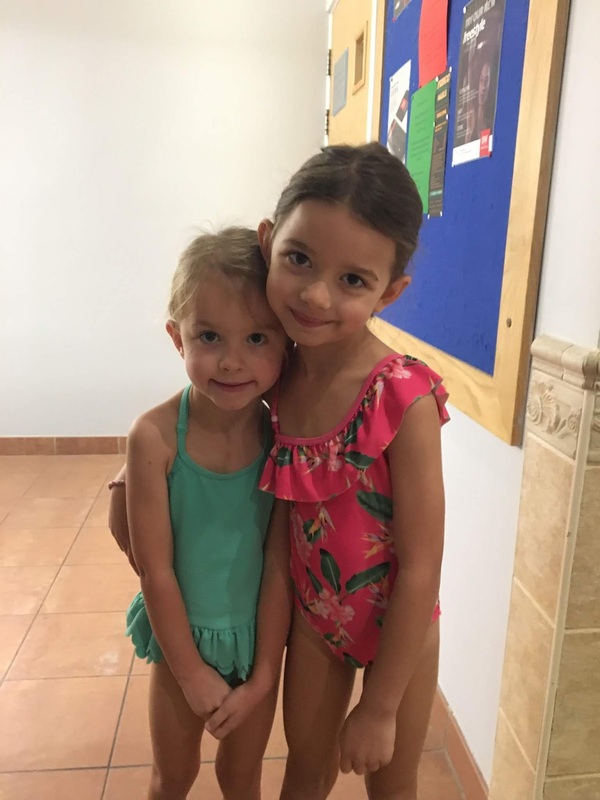 Swimming lessons is another milestone that most parents take for granted, but for us, it's one we didn't think we'd make it to. We feel so lucky that we are able to take her each week, that she's enjoying a normal quality of life after everything she's been through. She's never been one to be embarrassed about the scar down her sternum or on the side of her ribs, or even of the chest drain scars beneath her ribs. Luckily they are all covered beneath her swimming costume, I worry how other children will react when they see them. Martha knows they are there from her multiple operations and I hope she'd be happy to talk about them to anyone who asks about them. Disclaimer: We discussed swimming lessons with our Cardiolgist in October. Please consult your primary Cardiolgist to ensure swimming is a safe option for your child.